Allergan has recalled almost 170,000 sample packs of birth control pills because of a packaging error that could put consumers at risk for unintended pregnancy. 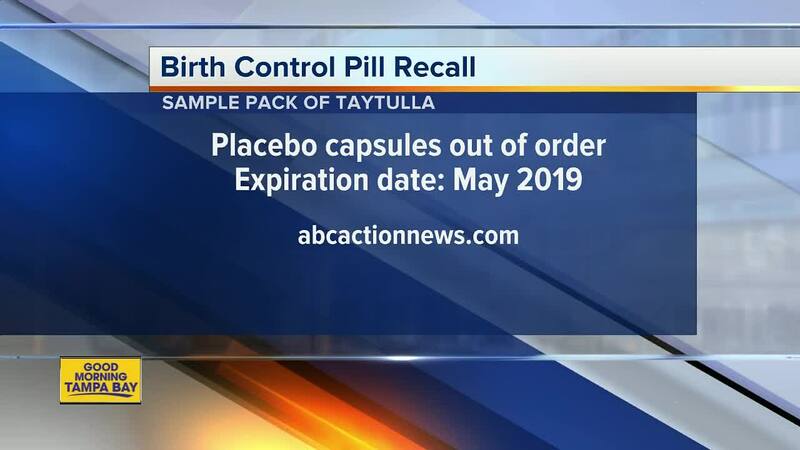 According to the recall, four placebo capsules were placed out of order in a sample pack of Taytulla and the first four days of therapy had four non-hormonal placebo capsules instead of active capsules. "As a result of this packaging error, oral contraceptive capsules, that are taken out of sequence, may place the user at risk for contraceptive failure and unintended pregnancy," The recall states. "The reversing of the order may not be apparent to either new users or previous users of the product, increasing the likelihood of taking the capsules out of order." Allergan says they are notifying customers by recall letter and is arranging for return of all recalled sample pack product with the lot #5620706 Exp. May 2019. Consumers who have the sample pack product with the associated lot number should notify their physician to arrange a return. Consumers with questions regarding this recall can contact Allergan by phone at 800-678-1605 8 a.m. to 8 p.m. Monday through Friday. Consumers should contact their physician or healthcare provider if they have questions.